Averia Sans Libre (Avería means “breakdown” or “mechanical damage” in Spanish) is an original 6 fonts family created by Dan Sayers. This font was created using an unique process by averaging multiple fonts is described, a process that is described at iotic.com/averia. 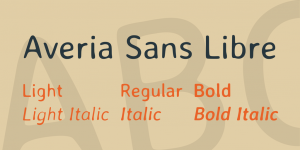 The Averia Libre families of fonts are based on the average of all 725 fonts in the Google Web Fonts project, released under the SIL Open Font License, as of 9 Nov 2011. A font family published by kreativ on Monday, September 11th, 2017 that has 1,716 views so far.